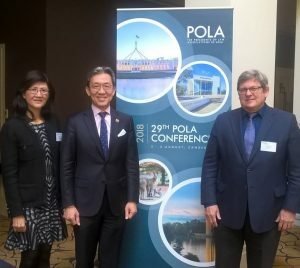 The Presidents of Law Associations of Asia (“POLA”) met in Canberra from 1-3 August, sharing experiences of legal practices in jurisdictions as diverse as China, Mongolia, India, Japan, Malaysia, Singapore, Australia and New Zealand, with special representatives from the International Bar Association, the Inter Pacific Bar Association and LAWASIA. Issues explored included the challenges of technological change to legal practice and regulation as well as workplace bullying and sexual harassment in the legal profession. Justin Dowd, Vice President of LAWASIA and Director of Watts McCray, said “It is important to maintain a regular dialogue of the issues impacting modern legal practice with neighbours in our region”. Pictured are the President of LAWASIA, Mr Chris Leong from Malaysia (centre) and Vice Presidents Melissa Pang, Hong Kong (left) and Justin Dowd, Director of Watts McCray (right).